A phylogeny is a hypothetical relationship between groups of organisms being compared. A phylogeny is often depicted using a phylogenetic tree, such as the simple one below describing the evolutionary relationships between the great apes. The genus Pongo includes orangutans, Pan includes chimpanzees and bonobos, and Homo includes humans, while Gorilla is self-evident. Scientist use data gathered about each of the groups, including physiological traits and genetic data, to compare the groups against each other. The ends of the lines represent the living organisms. Sometimes the lines are drawn shorter than other lines, which indicates that a lineage went extinct. The places that lines connect are called nodes. These nodes represent important changes in the lineage that gave rise to a new line. 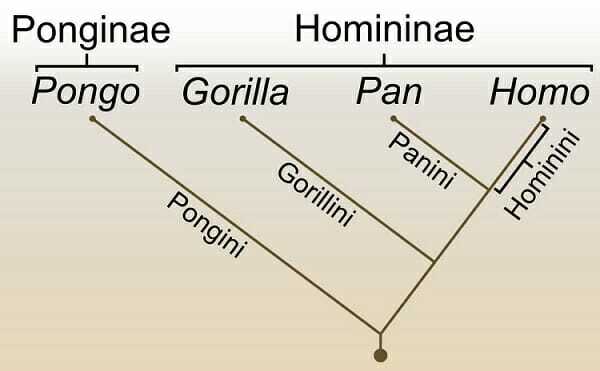 The Homininae represent a subfamily of the great apes. Through physiological and genetic markers, scientist have determined that orangutans diverged from this line a long time ago. This makes gorillas, chimps, and humans much more closely related than any of the groups are to orangutans. The Homininae is known as a clade, or a group of lineages that share a common ancestor. Typically, the organisms in a clade share a synapomorphy. In the case of the Homininae, they share the characteristic of being able to run efficiently on the ground, a step towards bipedalism. The orangutans do not share this ability, and spend most of their time climbing in the trees. In the above cladogram, the orangutan is considered the outgroup, as it is the least related organism, and is used to help distinguish the relatedness between the other groups. If scientists wanted to include orangutans in the clade being discussed, they would use a cladogram, or phylogenetic tree, like the one below. This cladogram includes the genus Hylobates, or the gibbons. Gibbons are even less related, as they diverged even further in the past than the apes. In this version of the phylogeny, the gibbons are represent the outgroup. Note that although the same phylogeny is represented, it can be drawn in very different ways. However it is drawn, the various nodes and lines represent a sequence of evolutionary events. As long as that sequence is the same, the two cladograms or phylogenetic trees represent the same phylogeny, or hypothesis. Scientist try to design a phylogeny that has the fewest changes, or nodes. Changes can only be produced by mutations in an organisms, or an event that separates a population. Both of these events are relatively unlikely. The founder of phylogenetic systematics, Willi Hennig, suggested that the most probable phylogeny would be the most parsimonious phylogeny. Parsimonious phylogenies have the fewest changes, compared to other phylogenies. Until recent advances in genetic techniques, this was considered more factual. Now, it has been shown that reversals and other very unlikely mutations have indeed been the cause of various organisms appearing out of place in the phylogeny. With additional information and genetic techniques, a clearer view of the relationships between organisms can be obtained. In conservation biology, scientist use phylogenies to help identify which organism to protect. Groups of organisms are designated as Evolutionary Significant Units (ESUs) to help identify biodiversity in organisms. For example, part of the reason it has been difficult for scientist to protect the interests of the polar bear is that the polar bear is still closely related to the brown bear. Evolutionarily, brown bears form three distinct lineages, of which the polar bear is a part. Polar bears are still able to successfully breed with brown bears. By contrast, the clouded leopard actually exists as 3 distinct ESUs. Populations of clouded leopards spread from Asia south, into islands like Borneo. As they spread, the populations were separated from one another and became genetically distinct. Each separate ESU is as differently related as lions and tigers. Thus, when making decisions about which animals to protect, scientists sometimes find it wiser to protect animals like the clouded leopard, which actually represent a lot of genetic diversity, rather than the polar bear, which is a relatively recent evolution of brown bears. A phylogeny can also be used by geneticists to help identify populations that are at risk for various genetic diseases. Because genetic mutations are responsible for genetic disease, they exist in populations in the same way that inheritable characters do. Therefore, geneticists can track and observe the occurrences of a disease in a population to identify its source, mode of transmission, and other important characteristics of the disease. Although these are just two simple examples of the uses of a phylogeny, they are used any time the relationships between groups of animals are being hypothesized. Cladogram – A diagram used to represent a phylogeny, also called a phylogenetic tree. Phylogenetic Systematics – The branch of biology that classifies organisms using phylogenetic methods. Parsimonious – The simplest phylogeny, which has the fewest number of changes between groups of organisms. Synapomorphy – A character, shared by two groups in a phylogeny, inherited from a common ancestor. 1. The cenancestor is the theoretical common ancestor to all life on earth. If a phylogeny is drawn with the cenancestor and all its descendants, which group would be excluded from the cladogram? C is correct. If the phylogeny contains the cenancestor and all its descendants, it will contain all life on earth. Theoretically, the cenancestor is the organism that started it all, and gave rise to all other life on earth. However, this is just one theory of the beginnings of life. Other theories suggest that multiple events occurred in which life started. In those phylogenies, there would be multiple trees presented, as each group would have a completely different origin. 2. A scientist wants to create a phylogeny that describes the relationships between different types of frogs. Which of the following could the scientist use as a suitable outgroup? C is correct. Of the options, only the salamander will not be part of the in-group, or group of organisms being compared. An organism like the salamander can be included to help distinguish the relatedness between different groups in the phylogeny, by way of comparison. By seeing how related frogs are to other amphibians, like the salamander, the relationships between the frogs themselves can be more easily discerned. 3. A scientist has developed 3 different phylogenies that describe the relationships between different species of elephants. In Phylogeny A, there are 4 total changes that resulted in 4 different species. In Phylogenies B and C, there are still 4 total species represented, however they take 6 and 8 changes, respectively, to create them. Which phylogeny is probably correct? A is correct. Phylogeny A has the fewest number of changes. This is more likely than lines of elephants evolving certain traits than subsequently losing them, in the process of reversal. Although this may happen sometimes, it is still more likely that the elephants evolved in the simplest way possible. More data can help show the accuracy of a phylogeny.